This article describes how to manage individual number settings for Zendesk Talk. For details about managing general number settings, see Managing Zendesk Talk numbers. The Allow outbound calls setting determines whether agents can place outbound calls to customers from this number. By default, this setting is enabled. Numbers that have this setting disabled won't appear in the call console as an option when agents try to make an outbound call. To edit a single number, click on the number you want to edit, and then toggle the Allow outbound calls field. To edit in bulk, select the check boxes next to multiple numbers, then select Disable outbound calls from the dropdown menu. For each number, you can enable or disable agent wrap-up. When wrap-up is enabled, Talk agents have time after each call to finish adding details to the ticket. 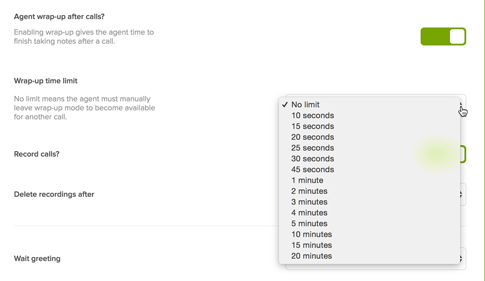 If you use Talk Professional or Enterprise, you can also limit the amount of time agents have to wrap up calls for each number. If you do not have the option to set a wrap-up time limit, or if you select No limit, an agent must manually leave wrap-up mode before they are available for another call. Set the Agent wrap-up after calls? option to on. Talk Professional and Enterprise: If you want to set a wrap-up time limit, select an option from the drop-down menu next to Wrap-up time limit. Note: If you do not have the option to select a wrap-up time limit, or if you Select No limit, an agent must manually leave wrap-up mode to become available for another call. Enable this option to play a message to callers on hold or, for Talk Professional and Enterprise, requesting a callback from queue, informing them of the current average wait time. This message plays only when the average wait time is over two minutes long. Note: The average wait time message is available in English only. Toggle the Average wait time message field to enabled. By default, tickets aren't created for abandoned calls. For Talk Professional and Enterprise, you can choose to enable ticket creation for abandoned calls for each of your individual numbers. When this setting is enabled, calls that are abandoned in the queue, in voicemail, or in IVR result in a created ticket, as long as a callback number is available. In cases where the caller is identified as "unknown", no ticket is created. Set the Create ticket for abandoned calls? option to on. Talk numbers with SMS capabilities can also be used for Text, allowing you to provide both SMS and phone support from the same number. For details about providing SMS support with Text, see Getting started with Text. Talk numbers that are capable of Text appear with an SMS icon in your list of numbers (Admin ( ) > Channels > Talk > Numbers tab). Click on the number you want to enable for Text. Toggle the Enable for Text field to on. To jump to Text configuration for the number, click the Configure this number for Text link. were can i start call people on this site plz help me im new and don't know what to do????????????????????? Can you tell us more about what you are trying to do? If you're looking for a support phone number, the admin on your account should have that number. we have different websites, each with their own telephone number. When a call reaches us, we need to make sure that we answer with the appropriate greeting, and that the agents know which website telephone number the caller has dialed. Will this information show up in Zendesk talk? I've assigned nicknames to each number, so will this nickname be displayed when they answer the call?